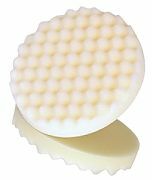 Single sided foam compounding pad used to refine P1200 or finer sand scratches. Flat back design. Coarse foam compounding pad used to apply compound to remove sanding scratches and swirls. Medium cut. Convoluted foam face design holds compounds better to reduce slinging of compound. Suggested for use with Perfect-It™ Rubbing Compound (39060, 06085, 06086). Use backup pads 05717 or 05718.